We are Big Day Rentals LLC, family owned and operated. Our goal is to help you make your "Big Day" even Bigger. 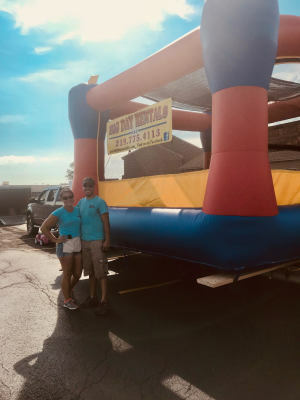 From back yard bashes to fancy festivities, we offer a wide variety of rental items that will make your "Big Day" unforgettable. We offer the essentials that will fit your party's needs and then much more. All of our rentals are commercial grade and made by top-of-the-line manufacturers. It is our pride and joy to make sure that all of our rentals are clean, safe, and efficient for your Big Day! Let us help you make your "Big Day" even Bigger! With each rental we require a signed Rental Agreement, which we will provide, and a 25% deposit to reserve any items for a specific date. We require payment in full one week prior to the event. Quantities of certain items may be limited, so please call ahead and guarantee your rental date. If you have any questions, comments, or concerns we would love to hear from you!